The most thrilling thing for me last week was touching the tidal pool specimens. Real sea stars. Real sea urchins. Vermillions (actually a wide variety of colors), bat stars (see the orange one in the back with the “webbing” between the legs/arms), awesome stars! The touch pool required me to wash and dry my hands, then use two fingers only on the top of the animal. The ones I touched were not hard, but rough and muscular. Sea stars come in all different sizes, which is difficult to understand when looking at a book. …adults are typically 16 feet from tip to tip and weigh between 50 and 90 pounds. 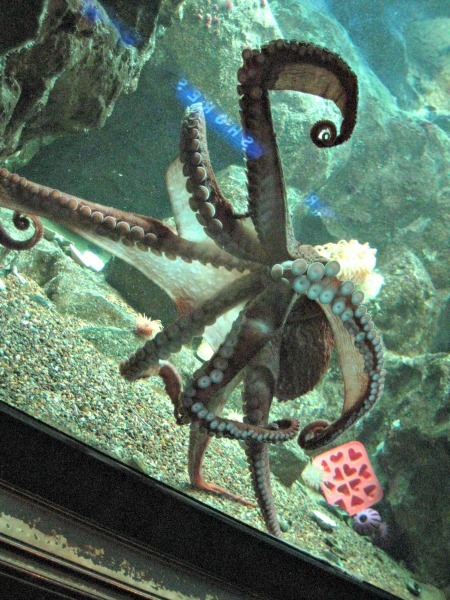 Still, the giant Pacific octopus (Enteroctopus dofleini) is one of the largest octopuses in the world. This is why field trips are very important to me. Tell me about your favorite field trip. 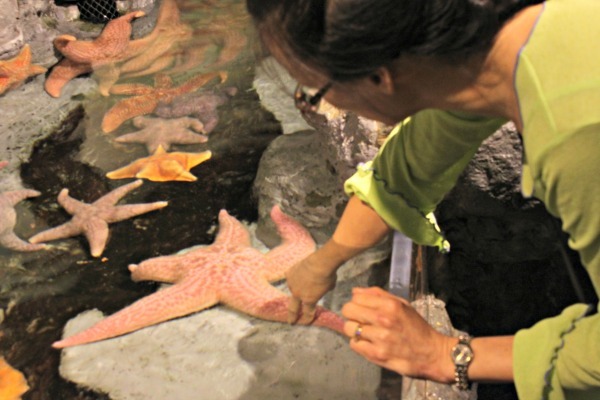 This entry was posted in home schooling and tagged chicago, sea star, shedd aquarium. Bookmark the permalink.